The US security firm Blackwater has resumed limited operations in the Iraqi capital Baghdad four days after a deadly shootout involving the company. The company provides security to all US state department employees in Iraq. It had been ordered by the Iraqi government to halt operations while a joint US-Iraqi inquiry was held. A US embassy spokeswoman said the decision to allow Blackwater to resume work had been taken in consultation with the Iraqi government. The spokeswoman, Mirembe Nantongo, said Blackwater operations would be limited to essential missions only outside Baghdad's heavily-fortified Green Zone. A separate Iraqi interior ministry investigation has found that Blackwater was "100% guilty" of the incident in which 11 Iraqi civilians were killed. 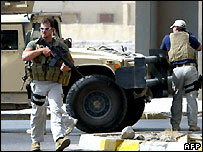 Blackwater says its guards acted in self-defence, but this has been disputed by Iraqi eyewitnesses. The interior ministry report, based on testimony from witnesses, concluded that Blackwater guards in Baghdad's Nisour Square started shooting after two mortar rounds landed nearby. "They started shooting randomly from four positions in the square, killing 11 civilians and injuring 12 others," said interior ministry spokesman Maj Gen Abdul-Karim Khalaf. "The first one who was killed was a driver who failed to stop and then his wife," Maj Gen Khalaf said. The report also calls for the lifting of legal immunity for foreign security companies operating in Iraq. The US embassy said it would not comment on the Iraqi report while its own investigation is under way. Iraqi Prime Minister Nouri Maliki has described the shooting as a "criminal act" and vowed not to tolerate it.